Turn off and unplug the engraver from the power source. Facing the rear of the machine, remove the eight Phillips screws which secure the rear panel to the machine. The laser tube is silver in color and sits directly above the exhaust outlet. 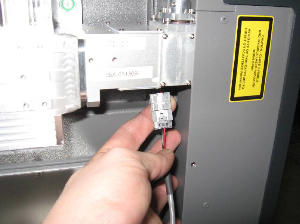 Disconnect the gray communication cable from the left side of the laser tube by pressing its plastic tab and pulling it free from the laser tube. Locate the red and black electrical wires that lead from the laser. 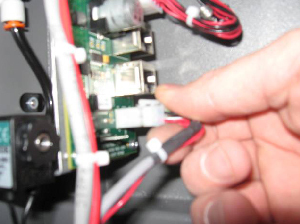 follow the wires to the white connector and disconnect the electrical connection to the laser. To unlock the connector, press down on the plastic tab of the connector and pull free from the plug of the wiring harness. Unplug the Red Dot Pointer, located on the right side of the laser tube. There is a small red and black wire that comes from the diode and connects to a black connector. Disconnect this connector by pressing on the plastic tab and pulling the connector free. 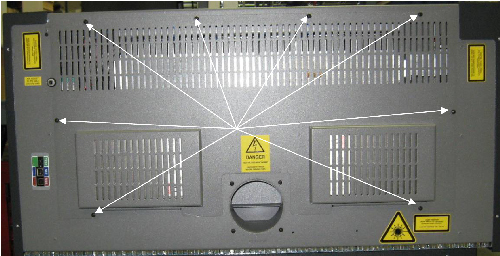 The laser is mounted via three captive screws, two on the right hand side and one on on the left side of the laser tube and two mounting pins. 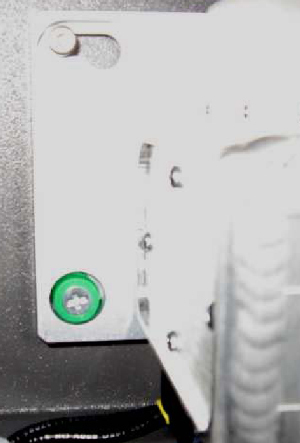 The pins retain the laser in the machine when the captive mounting screws are loosened. The captive mounting screws are identified by the green ring surrounding the Phillips screws. Loosen the Phillips screws all the way. 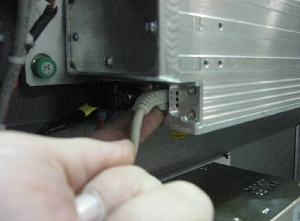 The laser will loosen slightly, but the mounting pins will keep it in the machine. See pictures 5 and 6 below for location of the captive screws and one of the mounting pins. 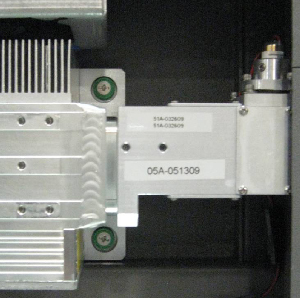 The mounting/guide pin on the right side of the machine is hidden behind the laser's heat sinks (fins). To remove the laser, gently slide the laser to the left and life the laser off of the mounting/guide pins. The laser can now be removed from the machine. Set the laser to one side. 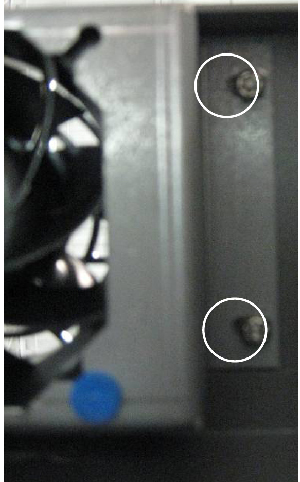 Using the 5/16 nut driver, remove the four 5/16 nuts which secure the fan panel to the machine and remove the fan panel. Install the new fan panel on the mounting studs. Do not tighten the nuts at this time, only start the nuts with 2-3 turns. 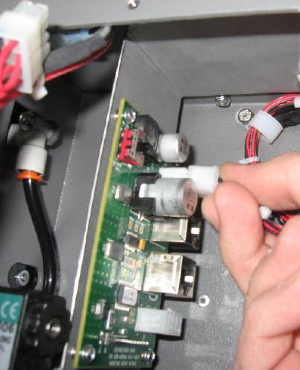 Install the fan control PCB mount. The mount fits on the right side of the machine between the fan panel mount and the mounting screws. 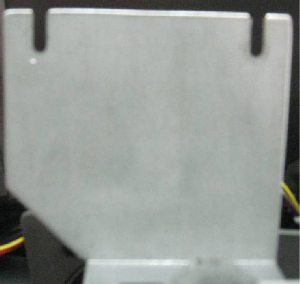 The fan control PCB mount has two cutouts, as shown in Picture 9. These cutouts fit over the fan panel mounting studs. 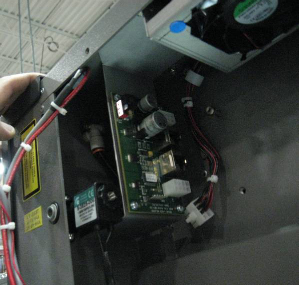 To install the fan control PCB mount, push the fan panel up and slip the mounting into place. 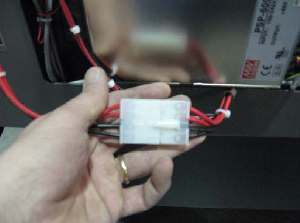 Gently tighten the fan's 5/16 nuts, which secure the fan panel to the chassis. 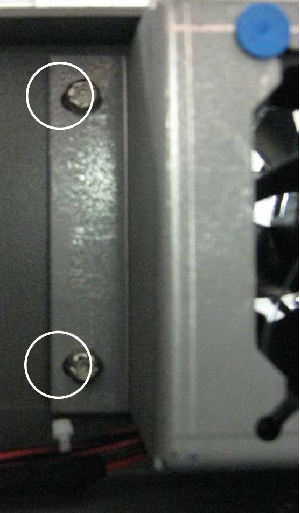 Note: The fan panel mounting studs are aluminum - do not over tighten them or they may break! 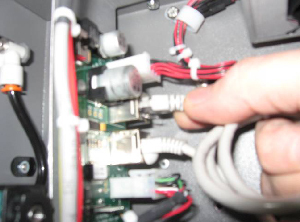 Plug the fan panel into the upper white connector on the fan panel. 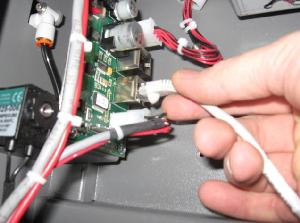 Connect the main harness data cable to the lower data port on the fan control PCB. Connect one end of the new data cable to the upper data port on the fan control PCB (Picture 12) and connect the other end to the data port on the laser. Plug in the main fan harness into the lower white connector on the fan panel PCB. Reinstall the laser tube into the machine. Hang the laser on the mounting guide pins. Gently slide the laser to the right until it stops. Tighten the green captive screws. Connect the Red Dot Pointer. Install the rear panel of the laser engraver.